so...how was everyone's weekend? good i hope. mine was packed with fun, friends and food! i went to a rascal flatts concert, watched some football, did some shopping and ate. but back to the books it is for me. gosh this week is gonna be a busy one. i'll probably be spending the week in comfy shorts, plain tees and booties. on the note of clothes...i wore this outfit to school last week. it was perfect because since i planned on being at school from morning to night, i needed something that was comfortable, kept me cool outside and warm inside (since the classrooms are like 50 degrees lol!) 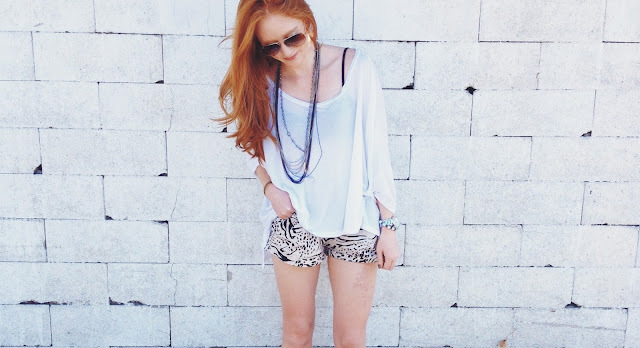 so cotton shorts, oversized tops and booties were ideal..and how cute is that print on my shorts! total love. I love this look! Especially those shorts! Love. love this look! those shorts are adorable! Your hair colour is stunning and gorgeous pair of shorts.